Samsung has been talking a rather big game with respect to its growing foundry business. In various investor conferences, the company has repeatedly claimed that it is aiming to be the world's top foundry and will transition to new technologies at a lightning pace. 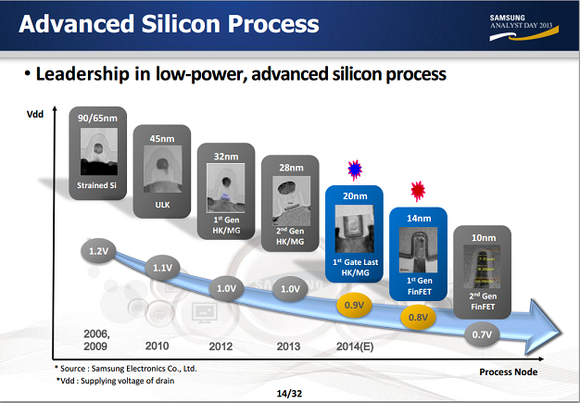 While such aggressive claims are always great for investor morale, it's important to understand that Samsung -- in the scheme of the semiconductor logic foundry business -- just isn't very significant. According to IC Insights, the largest player, by far, is Taiwan Semiconductor , which did nearly $20 billion in foundry revenue during 2013. Global Foundries is a distant second with about $4.2 billion, the struggling United Microelectronics is third, and Samsung is fourth at just shy of $4 billion. Notice that even with all of the Apple business to date, as well as some business from the likes of Qualcomm (traditionally TSMC customers), the company is still just barely pushing the $4 billion mark. If you thought the iPod, the iPhone, and the iPad were amazing, just wait until you see this. One hundred of Apple's top engineers are busy building one in a secret lab. And an ABI Research report predicts 485 million of them could be sold over the next decade. But you can invest in it right now... for just a fraction of the price of AAPL stock. Click here to get the full story in this eye-opening new report. The article Samsung Foundry Talks a Big Game, But Can It Deliver? originally appeared on Fool.com. Ashraf Eassa owns shares of Intel. The Motley Fool recommends Apple and Intel. The Motley Fool owns shares of Apple, Intel, and Qualcomm. Try any of our Foolish newsletter services free for 30 days. We Fools may not all hold the same opinions, but we all believe that considering a diverse range of insights makes us better investors. The Motley Fool has a disclosure policy.